silver5567 has no other items for sale. 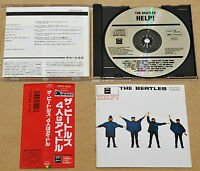 BEATLES - HELP, RARE ORG 1987 1ST PRESS JAPAN CD + OBI, CP32-5325 FREE SHIPPING! MARIANNE FAITHFUL - THIS LITTLE BIRD, ORG 1994 JAPAN CD + OBI, FREE SHIPPING! AEROSMITH - LIVIN' ON THE EDGE, ORG 1993 JAPAN CD + OBI, FREE SHIPPING!